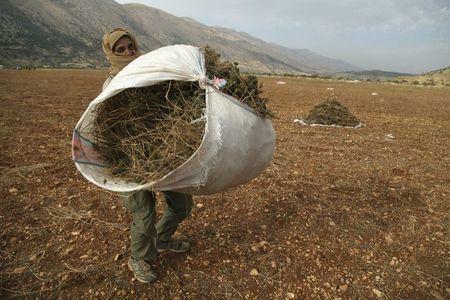 BEKAA VALLEY, Lebanon (Reuters) - Inside a garage in Lebanon’s Bekaa Valley filled with green dust and piles of cannabis, stand a woman and a 13-year-old boy, sifting through the twigs and buds of the recent harvest. They are Muslim refugees from Raqqa province - de facto capital in Syria of Islamic State fighters - and part of an extended family of about 25 that fled in the past few years to live in tents in the relative safety of a Lebanese village. The 29-year-old woman, who declined to be identified for safety reasons, left two months ago with her youngest son, 5, to join family including cousins, second cousins and grandparents. Wearing scarves over their faces to protect them from the crop, the women and their relatives work in fields of the sticky green, spiky-leafed plants. It is a job that migrant workers from neighboring Syria have done for many years, spending a few months a year in the region before returning home. Since the rise of Islamic State, it is now a task that could put them, and their family back in Syria, at risk of harm including death because working with, getting close to or consuming drugs and alcohol is considered a sin in Islam, refugees say. "If Islamic State back home knew we work with hashish, they would cut us" with knives, says another refugee, Aisha, 15. Hind, a Lebanese landowner, spoke of the longstanding ties between Raqqa and the Bekaa, a broad and fertile valley in the center of Lebanon. "Farmers from Raqqa have been coming to work our fields during harvest season for the past eight years," she says. 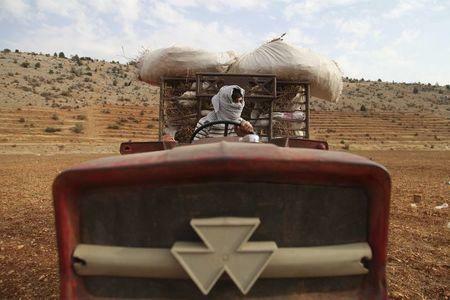 However since the rise of Islamic State, Hind says that the Lebanese villagers tend to view the Syrians with suspicion. The Syrian woman says she grew cotton on her 10 acres of land in Raqqa, adding that she often encounters racism from locals in Bekaa. "The Lebanese villagers sometimes call us Daesh," she says, using a derogatory Arabic acronym for Islamic State. Although what is said may sometimes sound like a joke, she says that she believes that some Lebanese regard Syrian immigrants from Raqqa with caution because of their home region’s association with Islamic State. Growing cannabis can be a lucrative business for landowners, even if it is illegal in Lebanon. 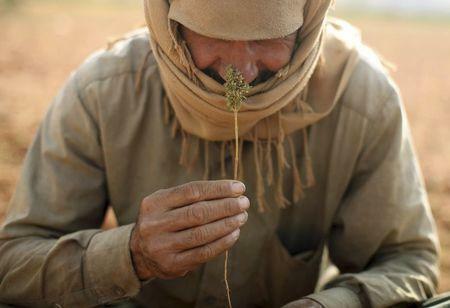 "Any job in Lebanon makes you $700 per month, but working with drugs can get you $10,000 a day,” says Sharif, a landowner and grower of cannabis. The woman earns $16 a day processing the plant, which allows her to send some money back home to her family still in Raqqa. Living in Lebanon has also given her and other refugee women a measure of freedom they didn’t enjoy in Syria, she says. "In Raqqa I have to be covered from top to bottom, even my eyes are not allowed to show," she says, wearing a tight veil, jeans and long top. "If I went out with what I'm wearing now, I would get a few whips" from Islamic State supporters, she adds. As she harvests and processes cannabis, the woman constantly thinks of family still in Syria, she says. She aims to get her husband and other son out of Syria to join her. “It was really hard to flee Raqqa,” she says, declining to give details on how she smuggled herself out of the country. The journey took about five days, much of it on foot. "I want my husband and son to get here, that’s all I want now."